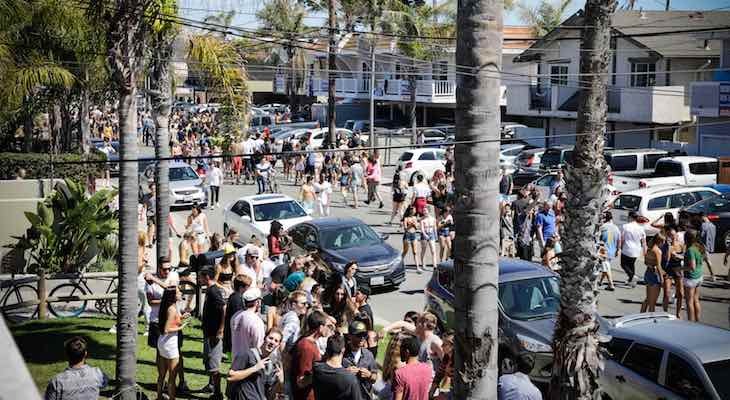 The Santa Barbara County Sheriff’s Office is releasing preliminary numbers related to the unsanctioned Spring Break party in the coastal community of Isla Vista known as Deltopia. The crowd was estimated at the height of attendance on April 6, 2019 to be approximately 12,000 to 15,000 people, which is an increase from the previous year (2018) crowd that was approximately 10,000 people; however, still dramatically lower than in 2014 when 20,000 to 25,000 people attended. The increase in attendance we believe was largely due to the beautiful weather which drew a larger crowd. The preliminary 2019 numbers for citations, arrests, and medical transports include both Sheriff’s Office and University of California Police Department statistics for Isla Vista and the UCSB campus for Saturday, April 6, 2019. Those arrested and cited were a mixture of locals and out of towners. An exact breakdown is not yet available. There were 94 citations, 38 arrests, and 19 medical transports. While the number of arrests and citations were higher than the previous year, the number of medical transports were lower. All of the transports were related to alcohol and/or drug consumption. The 2019 numbers for both arrests, citations and medical transports are still all less than half of what they were in 2014. Two of those transports included a young woman who slipped off a rock, fell and hit her head. The other young woman fell off the cliff in the 6800 block of Del Playa Drive during a domestic dispute. Alcohol appears to have been a factor in both cases. Neither of the women appeared to have life-threatening injuries. Sheriff’s deputies and UCPD Police officers broke up approximately ten large parties and responded to one significant altercation where a young man was knocked unconscious in the 6500 block of Del Playa. Deputies located and arrested the suspect, 18-year-old De’shon Wilson of Corvallis, Oregon. He was booked at the Santa Barbara County Jail on charges of assault causing great bodily injury. The crowds dwindled after 6:00 p.m. when thousands of students left Isla Vista to attend a UCSB sponsored concert at the Thunderdome. The Sheriff’s Office wants to extend our gratitude to the students, the many community partners and all of the first responders who have been a part of the continued effort to keep Isla Vista safe. Despite the larger crowd this year, the participants were mostly cooperative and supportive of our public safety efforts. I would like to know what it cost for the county and cities to prepare and respond to events like this. I presume it is a big annual over-time cost. On the other hand, as a community our leaders actively seek external visitors because of the positive economic impact they bring. I presume these "visitors" spend money too on food, booze, gasoline and some lodging. I think its a love and complain relationship. Hey kids having fun and being safe that's awesome - and rare in this helicopter bubble day and age. Drug addicts and alcoholics hate to hear "NO!" People who profit from those sales...don't like to hear no, either. For the last time (and this is getting exhausting)..... Deltopia was NOT and IS NOT a sanctioned event. It's basically an "illegal" party that happens every year. We can't "stop" Deltopia any more than we can stop all college "parties." Furthermore, why should we? Just because some people take bad drugs and make bad decisions, we should somehow crackdown even harder than they already do on parties? Let the youth be young and have fun once in a while! Yeah, some will get in fights, or drunkenly fall and hurt themselves, and yes, some may have a bad trip or even overdose on hard drugs. But, we can't bubble wrap every single college age person. OK? Just be glad some nutjob didn't go postal again. All the university stoonts should be required to take the pledge my grandfather recited while mixing cocktails: We don't drink, smoke, curse, swear, lie, cheat, gamble, nor fornicate, nor associate with them that do. That's great news. Sounds like it was a good party this year and a lot fewer folks got rolled up or harmed. I'm so glad it's Del-topia these days than Float-opia. The beaches sure are cleaner for the weeks after this event, and the snowy plovers are probably happy their chicks and eggs aren't being trampled. All you nay-sayers, hating on this- don't you remember how often people were drowning/needing CPR when this party was at the beach? This is way better. Defending Deltopia?!... That's like defending O.J.. There is no argument in favor of such a careless event. To say "It's been happening for decades", doesn't justify it. These are the same folks who will scream "It's not fair", when they are victimized in any way. Deltopia is for babies who aren't ready for an "Institute of higher learning". NO ONE is "putting" these young people together - I'm not sure where you're getting that info. Drugs in one hand. Narcan in the other. No to Deltopia. "Partying" = drugs and alcohol. It is not ok. Stop Deltopia. Any _one_ harmed student is one too many. Don't sanction, and make possible, places and events that harm our people. Not good. Deltopia is not sanctioned, that's why they shut down the beach and parking all over Goleta all weekend. But how do you propose to stop "partying?" College age adults party and get drunk and high, it's been that way for generations. I'm really curious though how to stop partying? Any tips would be great! "There were 94 citations, 38 arrests, and 19 medical transports." Have we become so passive that this seems ok? It is NOT ok.
WELP then that's the end of Fiesta. Lets see the citation numbers for THAT week. Not to mention the absolute destruction of downtown, where kids DON'T have post cleanup parties like they do in IV. It's a crown of almost 15,000 partying college aged adults. It's LESS than previous years in terms of medical issues. The citations are mostly due to noise or minor infractions, arrests due to drinking. Again, it's 15,000 young adults partying during spring break at a beach-side university. Nothing to freak out about. Stop Deltopia. It's simply a drug distribution event, from Los Angeles/Oxnard dealers. You train people how to stop death from overdoses, and then provide the setting FOR drug overdoses. This year, dramatic increase. Next year, let's do dramatic decrease. You've done it before, now do it again. Hey Sheriff's - so, was it worth inconveniencing a whole community for the weekend? Why they shut down half of Goleta each year for this "threat" is beyond me. College age kids will party, especially during Spring Break, this is nothing new. KTNOODLE - did anyone drown during the old Flotopias? It's to keep the trash on the street instead of the ocean/beach, and not trample breeding bird nests actually. That's the threat. OH, and drownings. Because stick a bunch of drunk kids in the ocean with no lifeguards and ya- drownings. Which haven't happened since it was moved from the beach to the street.